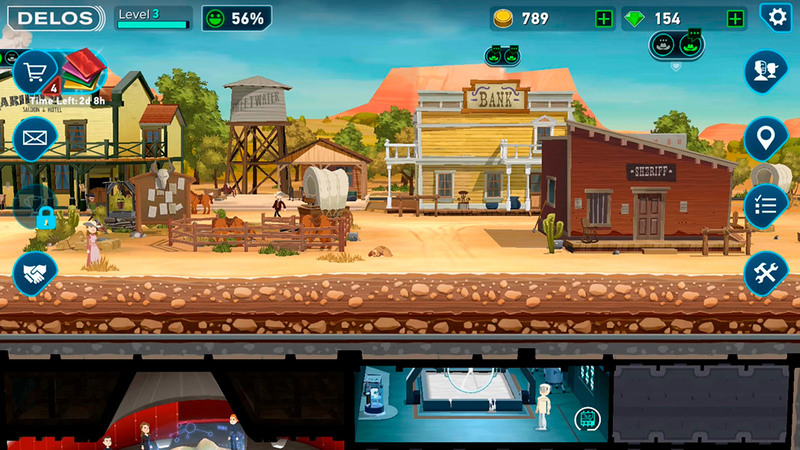 Westworld has arrived on Android! Enjoy managing your own theme park in this excellent strategy game. It’s becoming more and more normal to find television franchises dipping their toes in the sea of videogames, so it’s unsurprising to find a game like the incredibly successful Westworld. The HBO series has built up a huge audience and now it intends to do the same with this strategic management game. It’s a game that has surprised us with its great quality and that you can download for free from our website. Welcome to the park of the Wild West! Your job as manager of this theme park is to make sure all your visitors are able to get the complete experience set in the era of spurs and duels at dawn. But to do this, you’ll have to develop your base below the surface: a place where you create the hosts necessary to interact with the visitors, as well as create different buildings to help you level up and discover more things. Welcome to Westworld. The fact that this game is based on a successful franchise means that it comes with a fan base that’s sure to give it a chance. 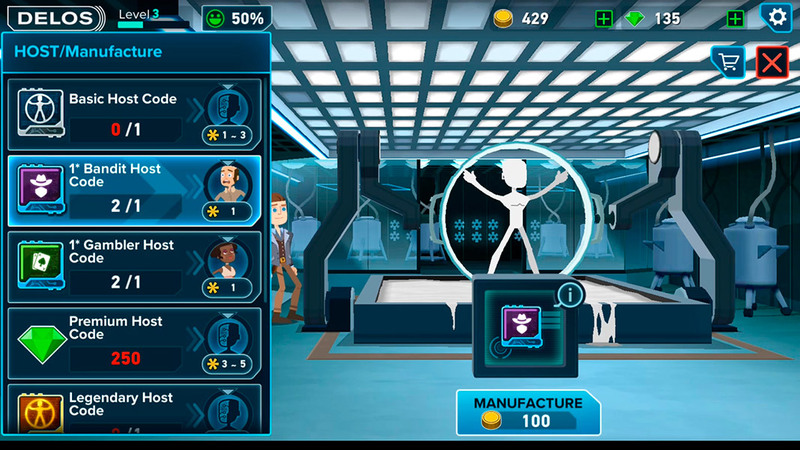 But don’t worry: anyone who loves strategic management is going to enjoy this game. It’s no coincidence that it’s similar to Fallout Shelter; it actually resembles the game from Bethsesa quite a bit, although luckily, it’s not a straight out copy. In Westworld, you don’t have to worry so much about micromanagement of your characters, but instead the most important part of the game is the interaction between hosts and guests: each host has different skills that you have to use according to the needs of the guests. If, for example, someone wants to play cards, then you’ll have to assign a host with this skill. The way it works is pretty simple, especially when you just get started playing. As you go, however, you’ll discover more types of hosts, buildings, and actions that require you to use more characters. 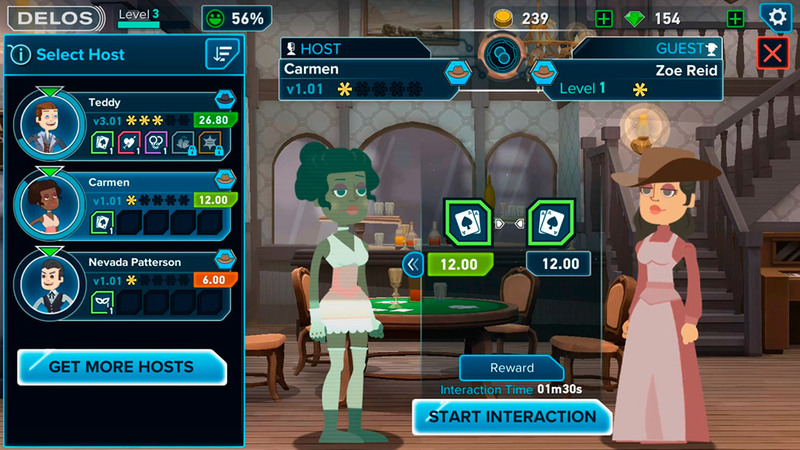 The great thing is that these hosts will also level up and you’ll discover more things about them, along with the gruesome story that they seem to be hiding under the happiness that they show the visitors to the theme park. Even if you’re not a fan of the TV show created by Lisa Joy and Jonathan Nolan, it’s a fact that Westworld is a fantastic game that’s worth your time. Yes, the always tedious wait times between actions can get annoying, but the game is well balanced during its first few minutes, long enough for you to fall in love with its gameplay. The similarities to Fallout Shelter are there, but that’s not necessarily a bad thing. We’ll see how this new game evolves, but we have a feeling it has a bright future if the developers just keep doing what they’re doing.